Our passion and respect for Yosemite and the rest of the Sierra is contagious and we hope that you are inspired by our team’s community service projects like Yosemite’s Annual Facelift or the Rim Fire Restoration in Stanislaus National Forest. We know that building a strong and connected community is paramount to running a healthy, vibrant and engaging business. 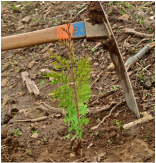 Yosemite Family Adventures is proud to be a part of the volunteers that are attempting to plant 98,000 trees in one of the largest effected areas of the third largest wild fire in recorded California history(Rim Fire of 2013). YFA is dedicated to doing our part in bringing back the forest for future generations to enjoy and to make sure we carry our weight in the reforestation process, it's our goal to plant up to 1000 trees per team member6. Yosemite is more than just our office and place of business, it's our playground and most important, it's where we go to let off steam and chase serenity. YFA is more than proud to be a part of Yosemite's Facelift program, where thousands of volunteers come together to help clean up Yosemite Park, one piece of trash at a time. Last year, almost 6,000 LBS of litter & trash was removed from this pristine wilderness & this year, we're hoping to follow in the footsteps of 2015. At YFA, we offer a 10% military discount to any active military member or veteran of the United States Military. This is our way of saying Thank You to our military members, past and present... WE SALUTE YOU!